Spring is here! Throughout the winter, the InstantEncore team has been working intently on the next generation of our mobile suite. And now, we are excited to spring forward with Version 2.0! Version 2.0 has a new look that appears uniformly across all three platforms: mobile website, Android app, and iOS app. No matter which mobile platform they are using, your app users will have a consistent aesthetic experience. Version 2.0 has three options for your app’s home screen: Icons, Slideshow, and What’s New. The Icons screen displays a 3 x 3 grid of icons connecting to various tabs in the app, which provides clear and concise navigation for app users. If you have 10 or more tabs in your app, the last icon in the grid will be an ellipsis (…) with the word “More” underneath. The More icon leads to a list of the remaining tabs. The Slideshow screen displays a series of full-screen images with a title/description in the upper left corner and a call-to-action area in the bottom right. The user taps the call-to-action area to go to the content in the app and swipes horizontally to move from one slide to the next. 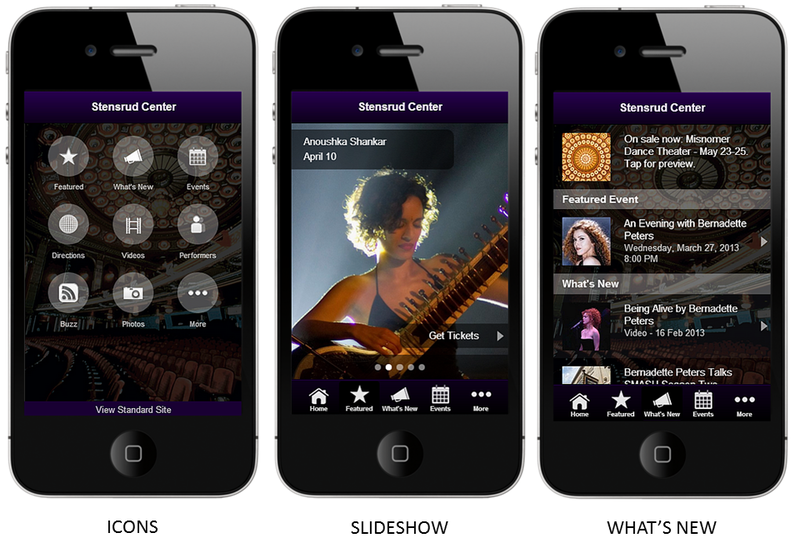 The What’s New screen is the same great home screen option from version 1.0 with a welcome message, featured event, and dynamic content stream drawn from the Music, Videos and Buzz areas of the control panel. Can’t choose? No problem. You can select one to be the home screen and use the others as the 2nd and 3rd tabs in your app. Use as many as you like in whatever order you prefer. It’s all about what works best for you and your audience. 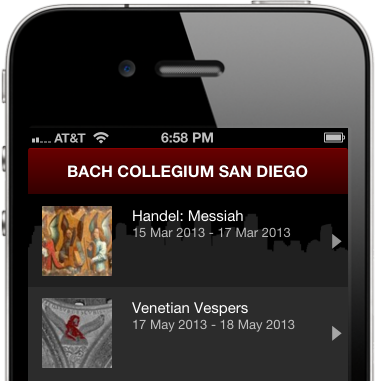 In the previous version of the app, each individual event was displayed in chronological order on the Events tab. With version 2.0, you also have the option to use the Productions tab, which groups multi-day events together in the app’s list of events. When a user taps on the production, they then have the ability to select a specific date for further information, links to online ticketing, etc. 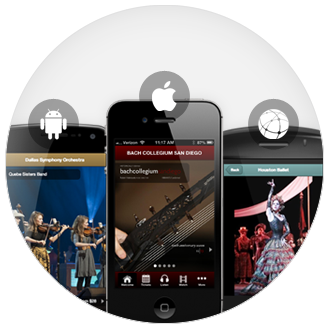 The Productions tab allows theatres, opera companies, presenters, and other performing arts organizations to display their seasons in a manner that is more easily scanned by their app users. Your mobile apps look better than ever on iPads and Android tablets. Version 2.0’s apps scale to fit tablet screens while retaining crystal clear picture quality. Version 2.0 makes it easy for your app users to share content from your app will their Facebook friends. With a tap of the finger, they can post events, videos, music, news items, and more directly to their Facebook profiles. That’s right. With version 2.0, you can import videos into your app from Vimeo by using embed codes. We have expanded the Live Video feature to work with Ustream and YouTube Live accounts as well as Livestream. Now, when you connect your mobile app with a live video broadcast, a special tab will be the first tab that users see while the event is airing. 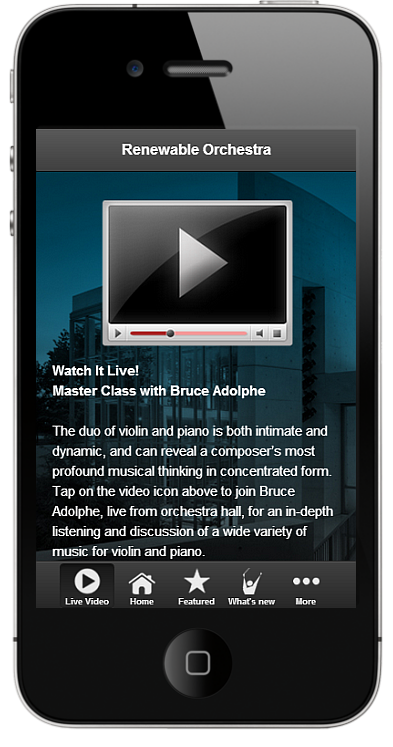 The tab contains your description of the live video event as well as a video icon, which takes the mobile user to the broadcast when tapped. With version 2.0, you are able to track the usage traffic for your mobile website separately from your Apple and Android apps using Google Analytics. In doing so, you are able to determine which content areas have higher usage rates and if there is a difference between usage patterns for those who visit the mobile website versus those who download the app to their mobile devices. Over the next few weeks, we will explore particular features in greater depth with an eye toward how to maximize them to provide your audience with the most engaging mobile experience. If you can’t wait and would like to learn more now, visit the Mobile Suite Tutorial playlist on YouTube for step-by-step instructions on how to work with these new features and more.